OAKLAND – Four former members of the defunct Your Black Muslim Bakery were ordered Friday to stand trial later this month on torture and assault charges for allegedly beating a man and threatening to rip out his teeth and tongue with pliers for disrespecting the memory of the organization’s late founder, Yusef Bey. 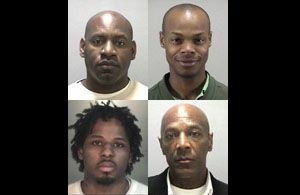 The defendants, Dahood Sharieef Bey, Basheer Fard Muhammad, Ajuwon FardJamaal Muhammad and Jonathan Moore, are alleged to have been part of a group of as many was 12 men who beat Jerome Muhammad on Dec. 31. Jerome Muhammad testified at a preliminary hearing in May that Dahood Bey told him he had disrespected Yusuf Bey as well as members of a Black Muslim group that Dahood Bey was leading. But Jerome Muhammad said he had only complained about the personal hygiene of another man with whom he was sharing an apartment. Dahood Bey, he testified, told him ‘I could kill you myself’ and then led the others in kicking and beating him for 30 minutes. Dahood Bey, born Cyrano Colar, was considered a spiritually adopted son of Yusuf Bey. All four men have pleaded not guilty. Dahood Bey, 37, Basheer Fard Muhammad, 56 and Moore, 27 are free on bail. Ajuwon Muhammad, 24 – Basheer Muhammad’s son – is jailed awaiting trial. Friday morning Superior Court Judge Allan Hymer rejected a motion by Dahood Bey to dismiss the torture charge against him. Jerome Muhammad’s testimony that Dahood Bey said the beating was because of “perceived disrespect to Dr. Yusuf Bey is sufficient” to define torture, Hymer said. So too, he added, was the length and brutal nature of the alleged beating during which “multiple hits were being inflicted on the victim.” The judge said the victim couldn’t walk for about a month, other than to go to the bathroom. Later Friday in another courtroom, Superior Court Judge Morris Jacobson said the men’s trial would begin Dec. 21 with hearings on various motions but that a jury would not likely be seated until early January. Dahood Bey and Basheer Muhammad were longtime followers of Yusuf Bey, who preached a fiery brand of rhetoric based on the teachings of late Nation of Islam leader Elijah Muhammad, who claimed Caucasians were devils and that blacks were the world’s superior race. Yusuf Bey started the bakery in Oakland in the early 1970s as a business and self-empowerment organization which often gave jobs to ex-convicts. Yusuf Bey died in 2003. His son, Yusuf Bey IV, eventually took control of the organization in 2005 and is awaiting trial on triple murder charges for allegedly ordering journalist Chauncey Bailey and two other men killed in 2007. The bakery went out of business following Bey IV’s arrest. Court records show Dahood Bey apparently started another Black Muslim organization, called Elijah’s Learning Center, last year. Basheer Muhammad recently railed against BART’s board of directors for canceling a contract with another former bakery follower, Nedir Bey, calling them “devils” and racists for not allowing Nadir Bey more time meet the bonding and insurance requirements needed to install improved lighting in train stations.